I think it’s safe to say that in 2018, the tablet market has not shaped up like anyone had expected, not even Apple. Tablets weren’t the next smartphone – and indeed the sales of dedicated tablets are downright soft – and yet at the same time tablets have successfully carved out a meaningful niche for themselves. But more importantly still, the tablet concept is everywhere even if “pure” tablets themselves aren’t. One needs only look at all the various PC 2-in-1s and convertibles to see the influence tablets have made on the traditional laptop market, forcing these many clamshells into becoming something more. As a consequence of the introduction of modern tablets and their subsequent efforts to secure their own place in the market, we’ve essentially seen the tablet and tablet-alike market bifurcate into two real clusters of tablet designs. On the one hand are the cheap content consumption devices – the iPads, Fire TVs, and myriad of cheap Android tablets. On the other hand is the far more exclusive market for high-end, productivity-oriented tablets; devices that don’t just consume content, but create it as well. This market has been slower to develop, but it’s also important for its own reasons, as it’s the real crossover point between tablets as envisioned by the iPad, and the traditional PC laptop market. Apple for their part has opted to go after both of these markets, and has done so successfully. The traditional 9.7-inch iPad needs no introduction, and while the iPad Pro is a little less known, the difference isn’t by much. Built upon the shoulders of the original iPad, the iPad Pro family takes things one step further, building towards not just a bigger and better iPad, but by giving the tablet the features that are needed for productivity and content creation, at both a hardware and a software level. The iPad Pro doesn’t try to be a traditional laptop, but it certainly tries to capture a lot of their usefulness, and this is especially the case for the 2018 iPad Pro. 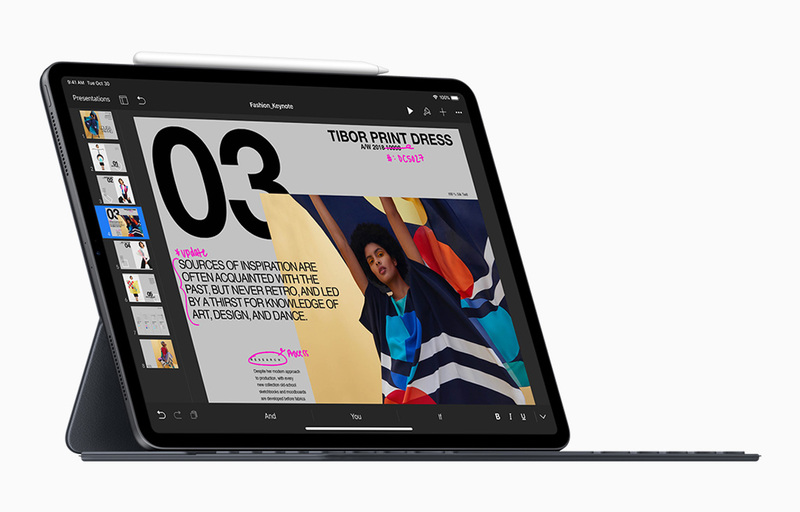 With the introduction of the latest iPad Pro models, Apple’s iPad lineup for 2018 offers arguably the largest design change since the original iPad launched. The new design offers a much higher screen-to-body ratio than ever offered before, mimicking what they’ve done with the iPhone lineup. As a result, Apple has more or less reinvented the iPad Pro design, and offers plenty of new features inside and out. Apple’s ambitions with the iPad Pro start with their chip design team, which has created the Apple A12X System on a Chip to power the latest iPad Pro. As outlined in our iPhone XS review, the A12 series of SoCs are already well ahead of the ARM competition, and Apple clearly has its sights on the performance levels of x86 CPUs from Intel. A12X features four Apple Vortex CPU cores, double that of the regular A12 in the iPhone, and seven A12 GPU cores which Apple says provides the power of an Xbox One S in a device with a far smaller power budget. 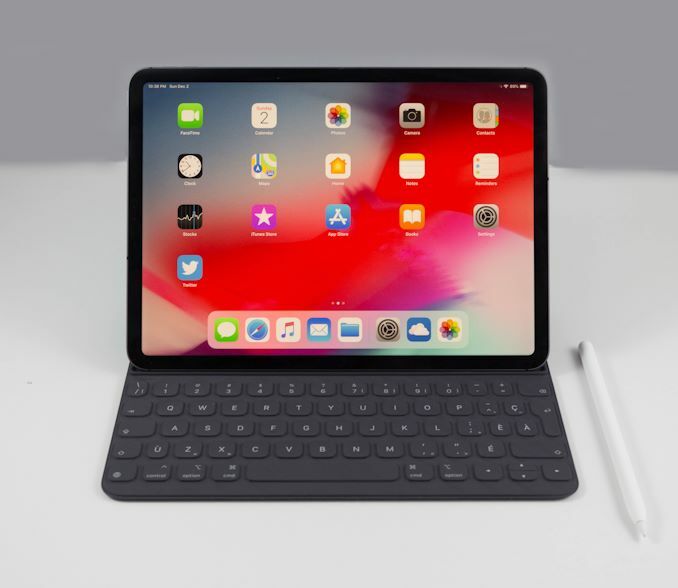 For better or worse, the iPad Pro is attached at the hip with Apple’s mobile operating system iOS, and unsurprisingly the iPad Pro ships with the latest version, iOS 12.1. Apple’s iPad Pro lineup has also been their test bed for their newest display technology, and the iPad Pro keeps the 120 Hz ProMotion display, which offers variable refresh rate down to 24 Hz, along with P3 display gamut coverage tied in with their color managed software. Apple also keeps their True Tone option to dynamically adjust the white balance of the display to match the lighting conditions of the room it’s in. Apple has also taken the opportunity to switch the iPad Pro lineup over from their proprietary Lighting connector to the more ubiquitous USB-C port, making this the first iOS device to offer USB connectivity. Where they give, they also take away though, and the 3.5 mm headset jack has gone the way of the Dodo, and for more or less the same reasons. For those that want to work on the go, Apple continues its excellent tradition of offering cellular connectivity with the iPad Pro, and those that need a lot of storage will be happy to see models up to 1 TB, which is more important because the iPad offers no way to access external storage to increase this. What first set the iPad Pro apart from the rest of the iPad lineup was the ability to use the Apple Pencil as well as a first-party keyboard solution. For the 2018 iPad Pro, both of these accessories have gotten refreshes as well. The iPad Pro for 2018 is a major change from the outgoing models. Let’s dig in and see how it fares. Crikey, that's a fast chip. For power/performance i have a few inputs. When looking at Nvidia jetsons running X2 and X1 most performance improvement are on the CPU side of things. Also for power refference. The Nvidia shield is not a portable device, and the nintendo switch, running the older version of the 256 cuda core SoC have the GPU running at 764mhz in docked mode and 324 in handheld. The reason is a combination of the battery and the active 30mm fan + somewhat heatsink, cooling solution. The charger is 40W charger, and while it does charge the battery, i will assure you no more than 15W is used for this, and based on charging time during full load, it's less than 10W. Note also that the screen is NOT on. It's several fabrication node shrinks back (28nm vs 7nm) and on a 2013 architecture.